Waste and waste water are removed from your home via your sewer system. While other systems can be turned off when there’s a problem, there’s no way to shut off your sewer. Problems with sewer systems arise frequently, and when they do, they can be disastrous. GT Campbell offers a full range of services for sewer repair in Canandaigua NY. From routine maintenance to prevent system failure later on to 24-hour emergency sewer repair, we are here for all your Canandaigua sewer repair needs. 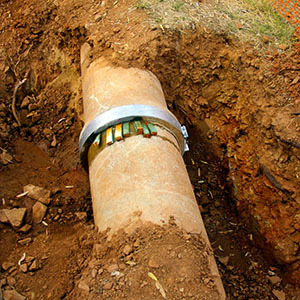 Sewer line problems require help from a professional. Whether it’s a clog, a damaged line or a nasty backup in your basement, only a trained plumber is properly equipped to handle sewer issues. Sewer line problems need to be repaired immediately. At GT Campbell, we offer fast, efficient and affordable services to solve the issue as quickly as possible. …and much more. No matter what you need, we’re here to help! Taking care of your sewer is the best way to prevent costly breakdowns. You should have your sewer system inspected, cleaned and serviced every year or two. Keeping up with this basic maintenance prevents major blockages and provides an opportunity to detect minor problems before they become major disasters. GT Campbell is proud to offer comprehensive sewer maintenance and sewer repair in Canandaigua NY and the surrounding areas. From basic maintenance to emergency sewer repair, our expert technicians do it all! When you contact us, we will send a plumber out right away to assess the problem and provide you with an honest estimate. Our services are guaranteed, and we’d be more than happy to help you get your sewer back in working order as soon as possible. Contact your plumber in Canandaigua NY.